W.K. Jerome Higgs is his birth name. He was born in a small town in Southern Missouri. He moved with his mom to Arkansas back in 1985 where life got in the way of dreaming for better things. Getting involved in street politics landed him in the Department of Corrections for 3 years.Upon his release, he found a new purpose and a new focus. He started a new movement with his mentor, T. Rodgers. Their vision was to teach kids to stay out of street gangs and to learn how to love themselves. Big Rome joined a community Masonic organization known as Spring Grove Masonic Lodge #305 in his community.The entertainment industry knows him as Big Rome a man of many talents. Being a member of the Famous Poets Society has bought him wins in their annual poetry contest, In 2002 winning poet of the year & in 2003 winning honorable mention. He is an amazing writer and rapper, being able to put his life story into a swag and a funk that your body automatically moves to. He has seen success with music placements in T.V./Films/Video Games ect. He is definitely an artist to watch.“Music Is My Passion” Says Big Rome. Don’t Expect For Him To Stop No Time Soon! 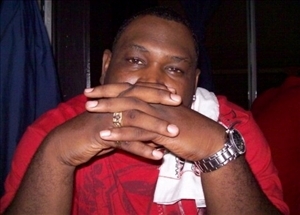 Big Rome\\\s new single "Strictly4Radio" was also recently featured on the Hip Hop Music website YoRaps.com (http://www.yoraps.com/next2blow1.php?subaction=showfull&id=1395994570&archive&start_from&ucat=4)and MyMusicMylife.com (http://www.mymusicmylife.com/artist-spotlight-interview-recording-artist-big-rome/)You can also check out Big Rome in an upcoming issue of Hip Hop Weekly magazine (The one with Benzino on the cover)HipHopWeekly.com.